Elodie, the dragon detective Meenore, and the kindly ogre Count Jonty Um are all on their way to Elodie’s home island of Lahnt. 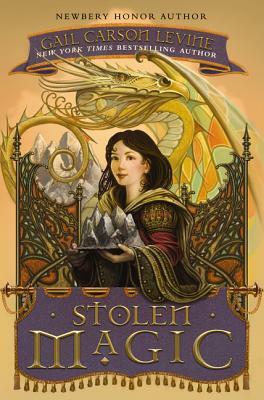 Elodie has barely set foot on land before she learns that the Replica, a statue that keeps her island’s deadly volcano from erupting, has been stolen! If the Replica isn’t found in three days, a mountain will be destroyed. And when Elodie ends up alone with a cast of characters that may all be guilty, she has to use her wits to try to unravel a tangled web of lies. The writing is consistently engaging, and the story’s deliberate pace will encourage kids to observe the characters and solve the mystery before all is revealed. A satisfying mixture of fantasy, mystery, and adventure. here is plenty of adventure and mystery to engage readers, and fans of Levine’s other works will be pleased to see this in the collection.